Development of State Street started in the earliest days of the 19th century when Joseph Holt Ingraham built his house near the waterfront at 51 State in 1801. By the 1830’s, it had progressed to the Spring Street area, the location of our subject. Built on the north east corner of the intersection, it’s a rather late period Federal. Comprising a 4 bay wide by 3 story brick block with a 2 storey ell to the rear extending down Spring Street, it is mostly devoid of exterior detailing but for the porch covering the entry on Spring, which seems to be of a later date, and the portico on the eastern, garden, side. Eastern portico showing rear ell. 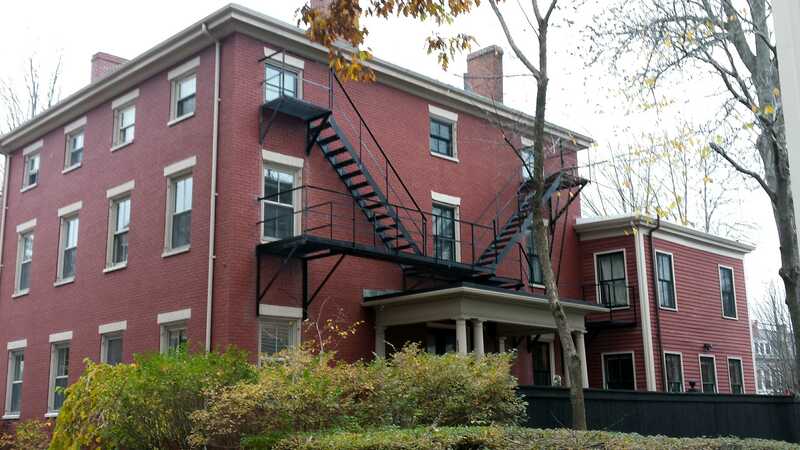 The fire escape was added when the house was a dorm for the Maine College of Art. Info for Samuel and his purchase are vague. There is no deed on file at the registry but it’s referred to when his heirs sold the home in 1854. It was purchased from William Willis, Portland’s well known 19th century historian and an attorney, and Solomon Mudge who ran a ‘lottery and exchange’ business on Middle Street. Holbrook was born in Connecticut in late 1776 or early 1777 depending on the source. By the time of his death in 1849 he was living in Freeport Maine. His profession is unknown. Samuel’s daughter, Julia appears to have been living in the home at the time of his death. An 1853 city directory lists an Israel Holbrook living at the ‘corner of Spring’. He was a seaman according to the directory. Israel was born in Maine in 1810. He moved to Harpswell when the house was sold. I cannot find a direct link between the two families but it seems too coincidental to be otherwise. The Holbrooks sold to John M Wood who was a merchant living on Middle Street. It does not appear he lived in our subject house. Over the next 45 years the home’s ownership woúld bounce between Wood, Jacob Lewis, a clothing merchant, and St. John Smith, a merchant, before being sold to George Packard in 1905. As mentioned previously, the porch parallelling Spring Street has details that place in a later time period than the house. The railing is in a ‘gingerbread’ pattern and supports square columns with chamfered edges. The columns have a banding detail with quatrefoil bosses. The capitals are compound and break into brackets with vertical incised bands. These support a frieze with delicate, maybe too delicate, scrollwork. Above this is a modified egg and dart molding that leads to a mildly projecting cornice. I have to wonder what brought George Otis Packard to Maine. He was a Roxbury Massachusetts native who was born to Otis and Julia Packard in 1837. Otis was an upholsterer and, in 1860, George was pursuing the same path. He and his wife Ada, who was a native of Ohio, married prior to 1870 at which time he was a wholesale linen merchant working in New York City and living in Long Island City. They had a daughter, Mabel, who was born in 1870. By 1875 the family had moved to a brownstone in Brooklyn’s 20th ward near the Naval Yard. They were new parents in 1875 with the recent birth of Edith. George’s mother and Ada’s father were both living with them along with with 2 servants. The garage facing Spring Street was new in 1923. This makes sense as there was probably a carriage house there prevíously. Those structures rarely survived when cars became popular as the cost of conversion was quite often more than building anew. It carries enough detail from the main block to be a part of the whole but even if obviously newer. The 1880 census found the Packards in Winthrop, Maine along with 3 servants and 2 boarders. George listed himself as retired. He was 43 years old which, even then, was quite early for retirement. It would seem George ‘made good’ in the late 1870’s. Why they chose Winthrop is an unanswered question. George’s father was from Maine. Perhaps there was a familial connection By 1900 they are living in Portland on Congress Street in a house that he had purchased from Hall Davis in 1898. In 1901, George became a member of the Maine Historical Society. Mabel had married a local surgeon, Arthur S Gilson, in 1895. They, and their son, Arthur Jr., were living with the Packard family as well. They certainly needed space. And space they got. The current tax information shows 2350 square feet of space over the 3 floors of the main block and the connecting block. One thing that is difficult to show in these photos is how this seemingly fairly symmetrical block of a building is actually a mash up of forms and shapes. The assessor’s sketch shows this quite well. In early summer of 1913 George deeded the house to Ada. He died in October. Ada is listed in the 1920 census as a widow. In early March of 1923 Ada deeded it to Mabel and with that, she disappears. I have not found any record of her death not burials for her or George. Mabel sold the property to Elizabeth Milliken in late April of the same year. Elizabeth B Milliken was the daughter of William H Milliken. Her grandfather, Henry senior, owned 130 Park Street and she was likely born there in 1885. She would grow up in her maternal grandfather’s home next door at 111-113 State Street. She never married. In fact, there is some evidence that she was gay. In 1925 she travelled from Liverpool to New York on the RMS Baltic, a vessel of the White Star Line. She travelled with Annie Lowell who was 16 years older than Elizabeth, a native of Gorham and gave her residence as 111 State Street. The same address as Elizabeth’s. In 1930, Elizabeth was living with Annie in a new house in the Cape Cottage Park neighborhood of Cape Elizabeth. She seemed to have been well travelled. Along with the 1925 arrival from Liverpool, she also was in Bermuda in 1923 & 1953 and Antwerp in 1931. With the purchase of 117, she would own a total of 6 properties all within 1/2 block of her family home on State Street. She sold the property, having never lived in it, in 1946.. Elizabeth died in 1962. Sophie Emery and Mary E Cushing were the next owners. Sophie remains mysterious. She first appears in the Registry of Deeds in 1939 when she purchased the house in the ‘wedge’ at the intersection of Pine and Emery Streets. When she sold this home in 1946, she stated she was ‘never married’. When she sold our subject house in 1961, she stated she was ‘widowed’. Her last name, one would think, would connect her to the Portland family of same name and eponymously named street. I have yet to be able to do that. Census and other records show a Sophia, wife of Eben, Emery in Portland but she was born in the 1850’s and appears to have died in 1912. As for Mary Elizabeth Cushing, she was a native of Lebanon NH and was living there at the times of purchase and sale of 117 State Street. Her parents were from Nova Scotia and her husband’s family was from Vermont. 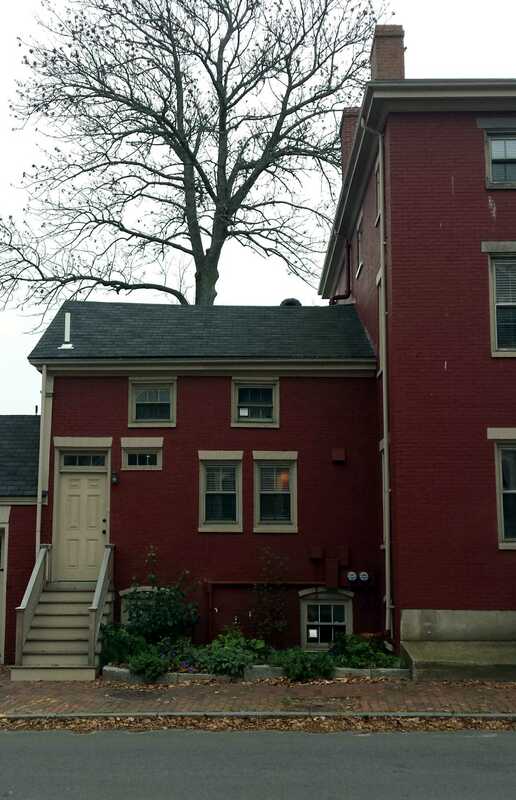 I can find no connection between Mary and Portland Maine other than her part ownership in this property. Perhaps she bought it as an investment and Sophie lived there and ran it for her but that’s complete conjecture on my part. The next owners were a couple from Gloucester MA named Johnson. I don’t believe they lived in the house as most of the 12 mortgages they took on the property over the next 10 or so years list them in MA. The home was foreclosed on in 1975. It would have 2 more absentee owners before being purchased by the Maine College of Art in 1994. They would use it as a dorm until 2007 when they it was sold to a local developer. It would change hands again in 2007 before being purchased by the current owner in 2013. It is, once again, a single family home. This entry was posted in Architecture, Brick, Federal style, Portals, Spring Street, State Street, Then & Now and tagged 19th Century, Architecture, Brick, Federal style, Greater Portland Landmarks, History, images, Maine, Portland, Portland Maine on December 22, 2017 by alewifecove. Would you do 48 state st please? I will put it on the list. It will be a couple of months before I will have it done. Apartment houses are somewhat difficult in that they are rarely owner occupied. Makes it harder to research the residents.